De Lappe, Lucille and Arnold Blanch. 26 x 36 in. ; 66.04 x 91.44 cm. Phyllis (Pele) de Lappe, artist, labor cartoonist and social activist, was born in San Francisco in 1916. She began her art studies at California School of Fine Arts in 1930 under Arnold Blanch, and the following year, at age fifteen, she moved to New York and Woodstock, where she lived with Arnold and Lucile Blanch. She enrolled in the Art Students’ League in 1932 where she studied with Kenneth Hayes Miller, John Sloan and Charles Locke. While living in the east she went to dance marathons in New Jersey and the nightclubs of Harlem. De Lappe worked with Siqueiros, and modeled for and assisted Diego Rivera on the Rockefeller Center murals. Returning to San Francisco in 1934, Pele found herself in the midst of the maritime strike. She got involved by joining the Marine Workers Industrial Union Ladies Auxiliary, walking the picket lines, raising money for the strikers and drawing cartoons for the union newsletter. 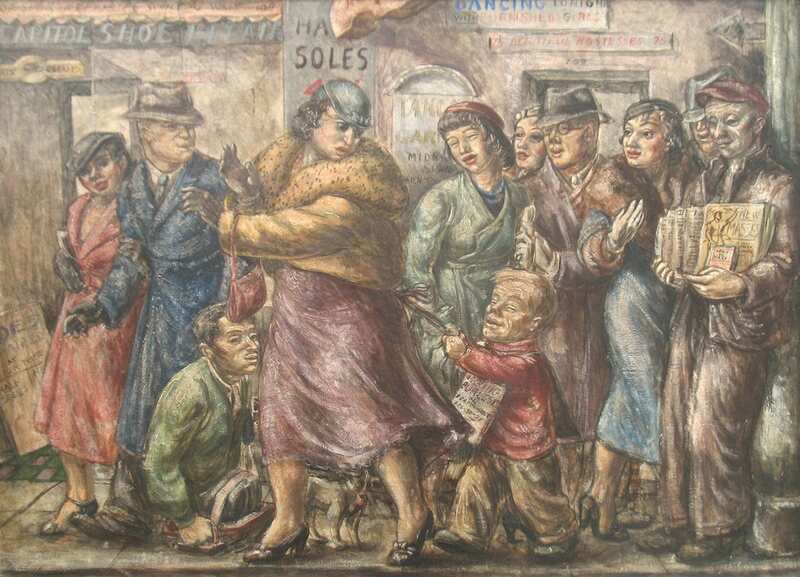 DeLappe’s art focused on the working class and she made a meager living by drawing for the Daily Worker, New Masses, L’Unita Operaia, West Oakland Beacon, and the San Francisco Chronicle. In the 1990s, DeLappe penned her autobiography, Pele: A Passionate Journey through Art and the Red Press. Her work is included in the collections of the Achenbach Foundation for the Graphic Arts, Syracuse University, Woodstock Art Association and the Library of Congress.